During a deadly hostage standoff, Chicago police officer Larry Parker witnesses a heroic act by a mysterious intervener. But when the Samaritan disappears, Larry is left only with unanswered questions. Suddenly vigilante activity begins popping up all over the city. Larry finds evidence pointing to the Samaritan, and discovers his identity – a loner known only by the name Rage. But Rage has also drawn the attention of a covert Black Ops division within the Pentagon itself. Seen as a liability to their secret operation, Larry finds himself in the crosshairs as well, and must find answers while on the run. The deadly chase leads cross-country to a top-secret military facility in Virginia, where Rage and Larry uncover the greatest danger of all -- and only they can stop the unthinkable from happening. Looking up from her files, Mira happened to notice the clock. It was lunchtime already. It was her third day of work at the newly-opened Chicago Loop branch of Beacon Therapeutic Social Services, and Mira had been asked to lunch by her co-workers Bernice, Edna, and Kim. Bernice was a black woman of about sixty who’d spent the past fourteen years at Beacon’s Longwood location. She was at least six feet tall, with a lean frame and bushy gray hair that wrapped around a kind but steely face. Wire-rimmed glasses always rested about two-thirds down the bridge of her nose. Edna and Kim had worked together at the Calumet Park campus. Both lived on the north side, so they had jumped at the chance to move to the Loop location. Edna was a witty lady whose neatly-styled white hair complemented her always-fashionable clothes, and who moved through life much faster than her short, 63-year old frame should have allowed. Kim, considerably younger than Bernice and Edna, carried a rougher edge through her day. Mira observed that Kim took on the most difficult cases, from child abuse to trauma. The circles under her eyes were but one sign that her cases had taken a long-term effect on her. She’d always schedule ten-minute intervals between clients to allow her to go outside and smoke at least two cigarettes. “One to detox from the last meeting, one to prepare for the next,” she’d say. The four of them found a booth right by the front window, and consuming helpings of pad Thai and pot stickers, chatted about their new clientele. Mira froze in her chair, forcing a smile in response. She fought off the hot rush of embarrassment rising in her face. Why, she thought, did people feel the need to break the ice with her using the topic of men? She was single, but had learned that saying so usually led to back-handed compliments (“How on earth could you be single?”), followed by the prospective introduction to someone or another. It was flattering for a while, but even the most genuine of compliments aged quickly when repeated too often. “Hmm, well, why do you ask?” she smiled back at Edna, trying to hide the slight bit of frustration her expression had surely given away. “I don’t care,” Bernice grinned at Mira, taking a sip of her iced tea. Edna flushed, taking a sip of her tea. “Okay, something like that,” she admitted. The subject then changed to the weather and other small talk. Soon afterwards, the four of them finished up lunch and headed back to the clinic for their afternoon appointments. 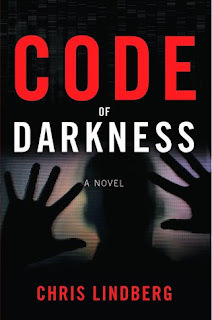 Or search “code of darkness” on Amazon or BN.com. You can also email him at chris@codeofdarkness.com – he’d love to hear from you.